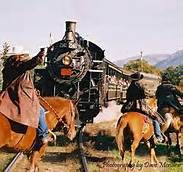 If someone were to ask you where the world’s first train robbery took place, you might guess a location west of the Mississippi River, or maybe even somewhere in Europe like London or Paris. But you’d be wrong. The Reno Gang, also known as The Jackson Thieves, was the first “brotherhood of outlaws.” Though not generally as well known as the James (Jesse) or Dalton gangs of Missouri and Kansas, the Renos were every bit as ruthless if not more so. In the years directly following the Civil War, siblings John, Frank, Simeon, and William Reno terrorized their native Jackson County, Indiana and the surrounding areas. At an early age, the brothers rejected their strict Methodist upbringing and began bilking travelers in crooked card games. As they matured, they graduated to more serious crimes like horse theft and other acts of out-right robbery. When the Civil War broke out, the Reno brothers took advantage of the bounty system (being paid to fight in another’s place) and enlisted in the Union Army to collect the bounty money. They each promptly deserted only to enlist again and collect another bounty payment, repeating the process multiple times. 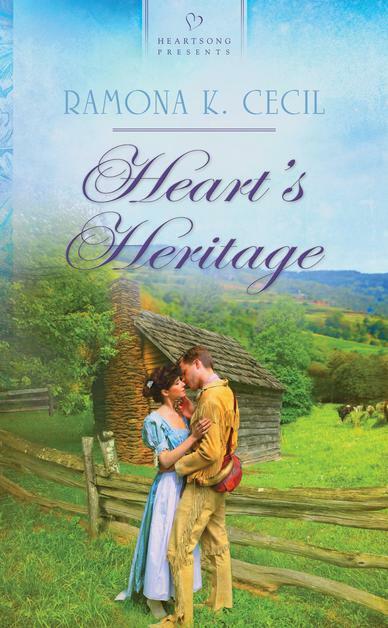 Only William remained in the army long enough to receive an honorable discharge. 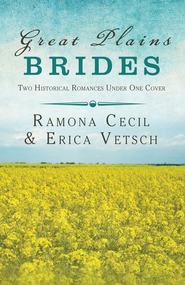 In 1864, the four brothers came home to Rockford, Indiana, just north of Seymour. Recruiting a number of other criminally minded men, they put together a gang and began such a reign of terror that travelers aware of the threat would go out of their way to avoid Seymour. It is said that, during those years, any traveling salesman who stopped in Seymour had a hundred per cent chance of being robbed, or worse, by the Renos. On several occasions, headless bodies were found floating in the local White River. Seymour was an important rail hub at the time, and on October 6th, 1866 John and Sim Reno with a gang member named Frank Sparks, boarded the Ohio and Mississippi Railway train as it chugged out of the Seymour depot. On the train, they restrained a guard, broke open a safe and stole $16,000. Then, from the moving train, they pushed off a larger safe for the rest of their waiting gang to collect. But unable to open it, the robbers were forced to leave the safe behind and flee the advancing posse hot on their trail. And so, the world’s first robbery aboard a moving train became part of history. In 1903 the crime inspired an employee of Thomas Edison’s motion picture company to produce The Great Train Robbery. This short film (inset at right) became the first action flick and launched the motion picture business. As for the Reno Gang, they continued to terrorize Jackson County and a large chunk of the Midwest for two more years after that first brazen train robbery. They avoided justice by killing or burning the property of anyone who dared to testify against them. 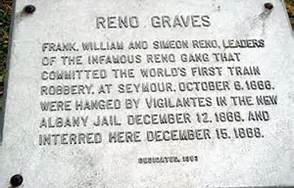 The term we would use today to describe the Reno Gang would be “domestic terrorists.” After robbing three more trains here, they fled to Iowa where they continued their crime spree sans John Reno, who was arrested and convicted of a Missouri courthouse robbery, and spent the next ten years in that state’s penitentiary. I found it interesting that during his stint in the Missouri prison, John became acquainted with Jesse James. After Jesse got out of prison, he, too, began robbing trains. Hmm. Wonder where he got the idea? 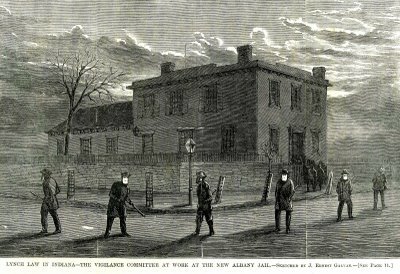 By 1868, the people of Jackson County were fed up with the Renos and their gang evading justice and formed the Jackson County Vigilance Committee. Taking the law into their own hands, they captured and lynched six members of the gang (but none of the Reno brothers) on a tree near a railroad crossing just west of Seymour. The place is locally known as Hangman’s Crossing. Today, a housing development simply named The Crossing, sits near the spot. Sure glad they dropped the “Hangman” part from the name. In the summer and fall of 1868, Pinkerton detective agents captured William and Simeon Reno in Indianapolis, Indiana, and Frank Reno and gang member Charlie Anderson in Windsor, Ontario, Canada. All four men were taken to New Albany, Indiana on the state’s southern border and incarcerated in the Floyd County jail, the strongest in the area, to await trial. John Reno, who missed the lynching because of his incarceration in the Missouri penitentiary, returned to Seymour in 1886 only to serve three more years in prison for counterfeiting. Upon his release he returned again to his home town and wrote his memoirs before dying of natural causes in 1895 at the age of fifty-six. I suspect every locale can lay claim to someone or some thing that is historically noteworthy. Though they evoke no sense of pride, ours—for good or ill—are the Reno gang and their perpetration of the world’s first train robbery. That, and being the hometown of singer, songwriter, John Mellencamp. But that’s another story. Loved this post! How interesting! Thanks for sharing! Are John Reno's memoirs published? Ramona, what a great post! I love reading this history of the old West. I can't imagine the lives these outlaws had. Everything about it had to be hard and I think always looking over your shoulder would be exhausting! Thank you for this very interesting read! Ramona, you have such a great grasp of history. Thank you for sharing this story. People didn't mess around with criminals in those days! Really interesting post! I live not too far away (Louisville)from you, & had never heard this story (nor did I know John Mellencamp was from there). I was there, just a few months ago. Thanks for the info. Thank you for sharing this fascinating piece of history! This was great to read. 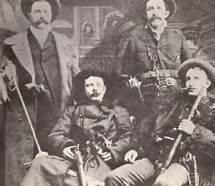 I like history about the James gang, so it was interesting to read about the Reno gang. Thanks, Susan. I don't think the James Gang had anything on the Renos. They were a bunch of really baaaad dudes! :) I just learned recently that John Reno and Jesse James became acquainted in prison. I found that fascinating! Thanks, Sharon. As I mentioned in an earlier comment, I never understood why the Renos never became better known. From what I've learned, they were every bit as bad as any of the better known gangs.